Bottom Line: Bekins Van Lines excels at full-service interstate moves and offers the convenience of online ballpark quotes to help you know if a full-service move is in the cards for you. Although Bekins has a long history in the moving industry, does it have what it takes to help with your move? Read on to find out if it’s the right choice for you. What services does Bekins Van Lines offer? Bekins Van Lines offers the full range of services you’d expect from a full-service mover. Whether you need packing assistance or help getting your car to your new home, Bekins has you covered. Although Bekins doesn’t offer many services that are out of the ordinary, here are a few that jumped out to us in our research. How much does Bekins Van Lines cost? If you’ve been trying to find a full-service mover for very long, you’ll be well aware that most movers require you to schedule an in-home estimate before they’ll offer any pricing information for your move. Bekins, however, is one of the few national movers that allow you to get pricing information online through an instant ballpark estimate after you enter an email address, phone number, and a few other details. 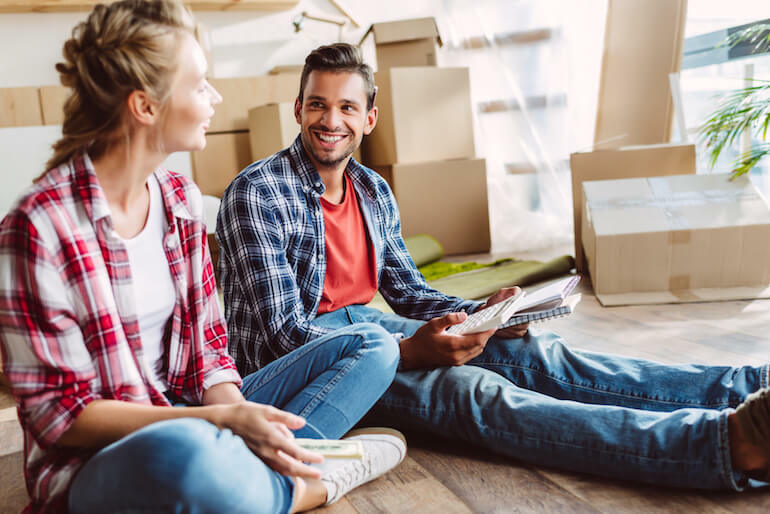 These estimates are certainly not as accurate as in-home moving estimates, but Bekins’ online quote can at least provide a ballpark figure for you to consider when you’re deciding which mover to choose. To get a better idea about what an average household move would cost with Bekins, we ran an example move through its online ballpark quote. Bekins offers both a low-end and a high-end estimate so you can get a better idea of the price range your move might fall into. It also allows you to add packing—both full-service and partial—and full replacement value coverage to your estimate. Check out the table below to see the price of our example move with Bekins. Based on Bekins’ ballpark estimate, our move could cost anywhere from $4,340.14 to $8,009.53 depending on the services we request. We love how Bekins breaks down these costs and offers a price range for each level of service you select—something only a handful of movers do. This can be a huge help whether you’re ready to choose a mover or you’re just starting to plan your moving budget. Despite how much we like Bekins’ ballpark quote, we still recommend you call and schedule an in-home estimate to get the most accurate picture of what your move will cost. Although we feel that moving with a full-service mover is well worth the cost, it can still be a fairly costly endeavor. Depending on the size of your move and the moving services you require, your final bill can add up. Luckily, Bekins Van Lines gives you a few opportunities to save money on your move. The first discount you’ll see when visiting Bekins’ website is associated with the Bekins Difference relocation program. It must be an interstate move in the contiguous United States. Your shipping weight has to be at least 3,500 lbs. Your pickup date must be on or after September 1, and your delivery date must be before April 30. Although many other movers offer similar discounts for moving outside of the busy summer months, few advertise exactly how much you’ll save by scheduling your move during the off-season. Bekins offers special discounts to members of its partner organizations. The biggest perk is getting up to $100,000 in free full replacement value protection. Not every partner organization receives the same benefits, but each receives at least guaranteed pricing for in-home estimates and guaranteed on-time pickup and delivery. Like many other full-service movers, Bekins Van Lines offers packing and unpacking services to help alleviate some stress during your move. As helpful as it is, however, full-service packing isn’t a small addition to your moving bill—no matter which mover you choose. Based on the ballpark estimate we shared earlier, Bekins’ full-service packing would add anywhere from $1,706.04 to $2,132.34 to our three-bedroom move. Not everyone needs their movers to pack up their whole house though, so Bekins (like many other movers) offers partial packing options that can better fit your needs and your budget. According to our ballpark estimate, choosing partial packing over full-service can save you about 60% on your packing costs. Bekins allows you to scale its partial packing services based on your needs.3 If you only need a few fragile items packed, your packing costs will decrease even more. This is pretty common among full-service movers, but we liked how Bekins illustrated the potential savings this offers. Be sure to tell your local Bekins agent about your specific packing needs to get a more accurate picture of how it’ll affect your moving budget. Even if you opt out of Bekins’ packing services altogether, you can still turn to your Bekins agent for moving supplies to box up all your belongings. Many Bekins agents offer boxes and moving supplies at a discounted rate. Depending on the size of your local agent’s discount, this can save you quite a lot of money compared to buying boxes from a home improvement store like Lowe’s or Home Depot. Keep in mind, however, that not every Bekins agent offers boxes for sale, so be sure to ask what materials they can provide for you during your in-home estimate. Bekins Van Lines has all the services you would expect from a full-service mover, but it doesn’t advertise too many services that help it stand out from the crowd—with the exception of its ballpark estimates, of course. That shouldn’t scare you away, however. Just because Bekins doesn’t have many particularly unique services doesn’t mean the standard services it does offer aren’t any good. Aside from the basics like packing and storage, we like Bekins’ commitment to safely transport pianos and other specialty items like pool tables, artwork, and delicate furniture. These items can’t simply be hauled into the back of a truck, so we appreciate Bekins’ specialized loading procedures that keep these items damage-free during your move. What do Bekins’ customers have to say? Bekins Van Lines is a good option if you’re planning a long-distance move and you can take advantage of any of its advertised discounts. It’s not our first choice for an interstate move (see our Best Interstate Movers list to see our recommendations), but its online ballpark quote makes it a great first stop to learn how much your move might cost with Bekins—or any other mover, for that matter. Despite the convenience of Bekins’ ballpark quote, we always recommend contacting your local agent and reading through its customer reviews to get a better idea of how well it can service your move. Have you moved with Bekins Van Lines? Let our readers know about your experience in the comments below! Missing items Bekins I would never use them . 6 major moves never had this happen. Their response there is no proof I had these items. Furniture, kitchen items, clothes and various decor items. Move N CA to E PA.